There are so many things right about this musical. It doesn’t take itself too seriously. It has some catchy tunes and is genuinely funny – naughty and knowing. It lifts many jokes straight from The Meaning of Life, but doesn’t suffer for it as in the main it is extremely well acted. The campness of the knights is exaggerated, the songs actually advance the plot and the characters are well developed. Jodie Prenger and the company are excellent. In fact, they are all so good that they act Jupitus off the stage. Celebrity actors are often very successful when trying their hand at theatre and musicals. Kiera Knightly and Elizabeth Moss were great in The Childrens’ Hour, Tamzin Outhwaite made Sweet Charity her own in the recent Menier production, and Nigel Harman is the best things about Shrek the Musical. However, whilst the transition from screen to stage has a relatively good hit rate for the dramatically trained, the move from the standup circuit to treading the boards has recently shown some dire examples of why actors should stay actors and comedians comedians. Phil Jupitus has comic timing, but that’s about it. He looked bored – I think he was looking at the stage floor for most of the performance. A sense of ‘going through the motions’ is the most off-putting of all on-stage failures, and amongst a group of enthusiastic and talented professionals, Jupitus’ performance was thrown into sharp relief. When he finally managed to muster a hand gesture during the final song I genuinely asked myself if that was the first time he had moved his arms in the entire performance. Richard Blackwood was similarly unimpressive as Donkey in Shrek (still previewing) last month. His failings appeared to be more from nervousness and inexperience than the complete lack of excitement seen here. Hopefully Blackwood will have improved by opening night (and if anyone wants to give me press tickets I’d be more than happy to come along and judge on that one…), but there appears to be little hope for Jupitus. He obviously doesn’t want to be there and should probably go back to what he does best – humming the introduction to long-forgotten tunes behind the safety of a BBC panel show desk. One of the biggest surprises of my recent concentrated theatre time has been the high quality of the performances of understudies. Often when I have been faced with them on these bigger shows, they have outshone their accompanying ‘regular’ actors. Hunger and drive is always apparent in their performances, and it is almost always a treat to be able to see them give their all for a rare chance in the spotlight. Rachel Muldoon understudying as Roxie Hart in Chicago was a great recent example of this. Celebrities undoubtedly bring extra ticket sales, but if they are unqualified and unenthusiastic then one has to question their long term value to a production. Todd Carty (another Easternders’ alumnus) was fantastic as King Arthur’s put-upon, Baldrick-esque sidekick Patsy, and all of the knights shone out as fantastic actors, dancers and singers, commanding the stage throughout. There’s so much willing talent out there, it’s a huge shame to see opportunities wasted on the unworthy and unwilling. All is not lost, however – Marcus Brigstocke is appearing in the role of King Arthur for some dates on this tour. 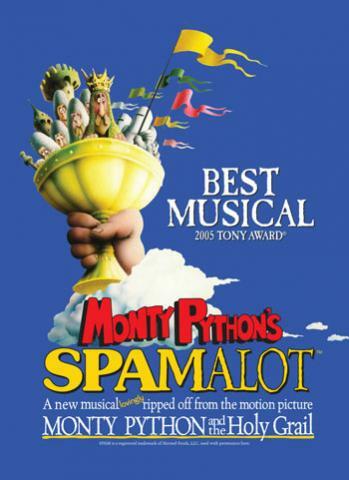 It starts in Southampton tonight and then is in Brighton for panto season (see Spamalot UK Tour dates). Everything else in this production promises a great night – just check out who your leading man will be before you book.